Bursa Romana de Arta este un indice al pietei reale de arta contemporana. Nascut in 4 decembrie 1982 la Gaesti in judetul Dambovita si absolvent al sectiei de pictura a UNARTE (clasa Cezar Atodiresei, asistent Alexandru Radvan) Dragos Bojin este in present masterand al aceleiasi sectii la clasa aceluiasi profesor. 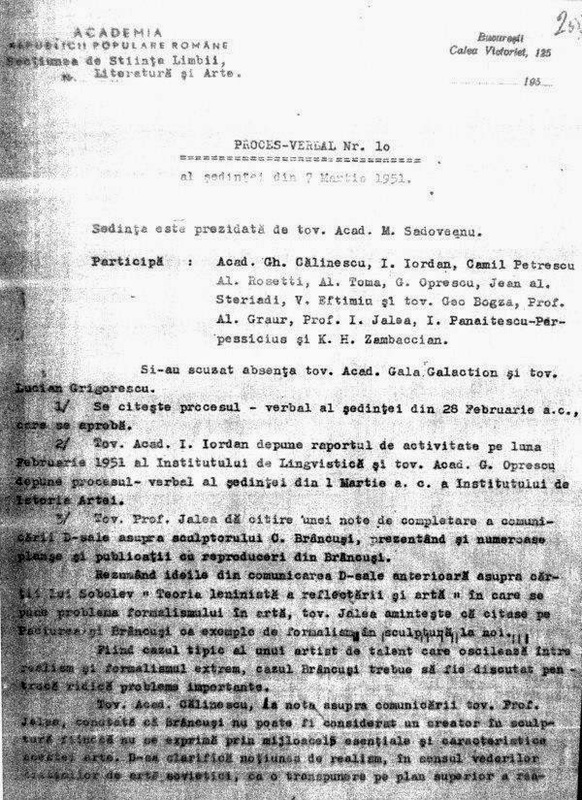 Isi prezinta pentru prima data lucrarile in 2012 la Expozitia de licenta organizata de UNArte Bucuresti in Sala Brancusi si dezvolta ulterior alaturi de Mircea Dragomirescu si Andrei Tudoran proiectul Hap.. dupa dulap, proiect ajuns deja la cea de-a treia editie. In cadrul evenimentului Noaptea Galeriilor 2014, Bojin se dezvaluie cu succes in compania sculptorului Aurel Vlad la Oxigen#5 si dovedeste ca poate duce mai mult. Tot anul acesta, in luna aprilie, expune la OrigameStudio alaturi de prietenii sai la cea de-a treia manifestare Hap… dupa dulap. Expozitia cu numele Matamorfoze este un succes oferindu-i artistului sansa primei expozitii personale in Bucuresti, la Galeria ArtXpert si apartenenta la Expresionismul Balcanic, miscare aflata in plina expansiune dedicata manifestarilor notabile, pline de curaj, ale tinerilor artisti in general. Artist anxios, agitat si nelalocul lui, Bojin isi gaseste scaperea in pictura: scaparea de proprii demoni, scaparea de angoasa si de nesomn, scaparea de o stare de fapt care ucide artistul inainte de a se naste, scaparea dintr-o lume care te consuma rapid si fara menajamente. 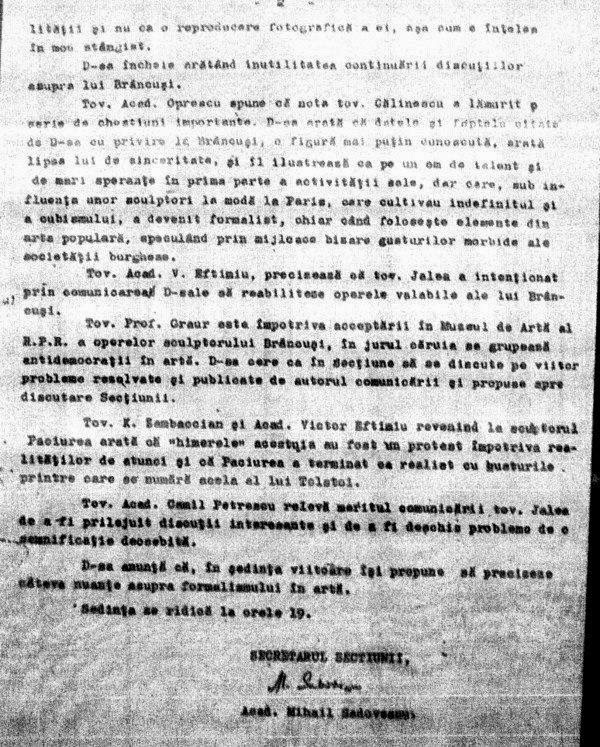 Bojin isi expune Nalucile in forta, aproape frenetic, pe panzele generoase si suficient de rezistente pentru a face fata demersului neguros al artistului; prins intre lucrarile sale, privitorul are acces la cele mai ascunse unghere ale unei minti tenebroase, desprinse parca din universul lui Munch. Fiecare panza este materializarea strigatului vibrant ale unei societati mucede demult alterate, rabufnire eminenta a unei frici colective. In 5 iunie Dragos Bojin iese din vis pentru a ne aduce ultimele pagini ale jurnalului sau de calatorie. Lucrarile sale nu au nume.. sunt proaspete si asteapta sa fie numite de fiecare privitor in parte. 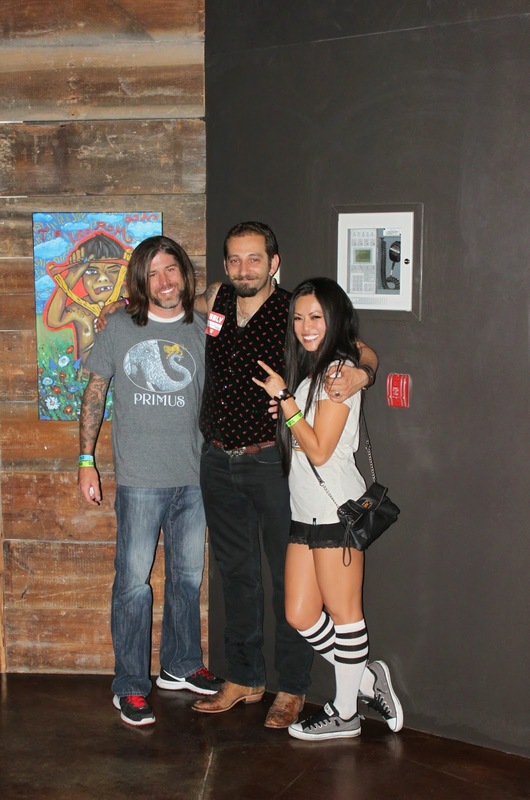 Paul Hitter show in Las Vegas in a joint event with Gogol Bordello at Brooklin Bowl April 29th - May 5th. A body of work containing poster size digital prints on canvas signed and numberd was displayed at one of the most up and comming venues in Las Vegas, The Brooklin Bowl. Public at House of Blues on Sunset, West Hollywood, Friday May 9th ,2014. "Half way to the end of the show we succeeded to sell four of Paul Hitter’s painting out of his “Balkan Expressionism Manifesto”. Prices ranged from 400 euro - 1200 euro. "A Man Without Moustache is Like a Woman With Moustach"
Launching The Balkan Expressionism Manifesto with a unique artshow of Paul Hitter, the Godfather of this mouvment! The Balkan Region is a melting pot of bright colors, ethnic patterns, bed time stories and legends ready to explode across Central and Eastern Europe. The Balkans is virtually unknown to the Western world, rooted in an aura of mysticism, misunderstood ethnic traditions and threatening people. In reality, the Balkan culture, ethnicity and peoples are as culturally unique and rich as in any other part of Europe. 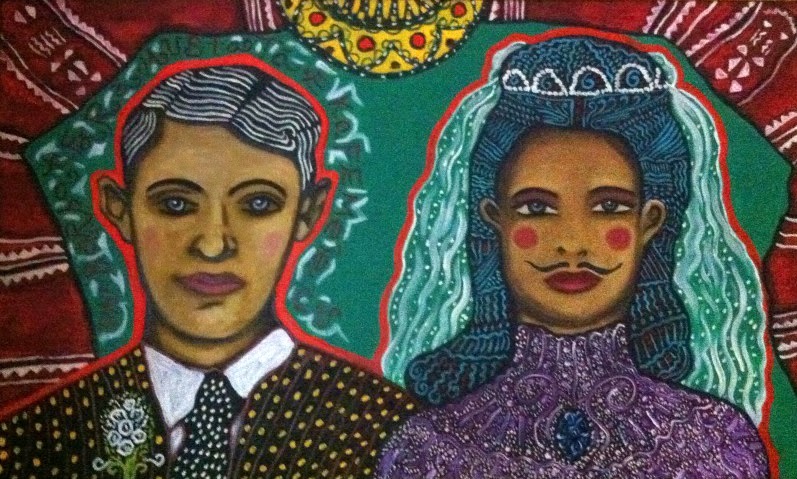 Balkan artists are traditionally ignored by the world in part due to geographical separation as well as cultural and prior political barriers imposed on them by past communist and socialist leaders. In many cases aspiring Balkan artists were simply not able to travel to the west to exhibit their work and limiting the spread and influence of Balkan artists. Conversely, the few western artists whose art was influenced by their travels through the Balkans were able to make some splashes in the hermetic, corporate western art world. It is more obvious than ever that Western Europe treats Balkan artists like second class citizens. The Balkan Expressionism Movement is a response to this situation with a goal to be an umbrella and unifying voice for painters, writers, sculptors, architects, musicians, and poets from a society with a low level of international respect, but with a great deal of genuine talent. Collecting centuries of ethnic, aesthetic tradition flowing throughout South-Eastern Europe, this new artistic movement is slowly making its way to the surface of popular western culture, entertaining the masses, the new proletarians. Movies like “Black Cat, White Cat”, bands like Gogol Bordello, or simply gypsies playing music in numerous city streets, piazzas, parks and squares demonstrate the public interest in this culture. Many creative people have recently begun to share the same aesthetics, building a strong audience for this type of artistic manifestation. 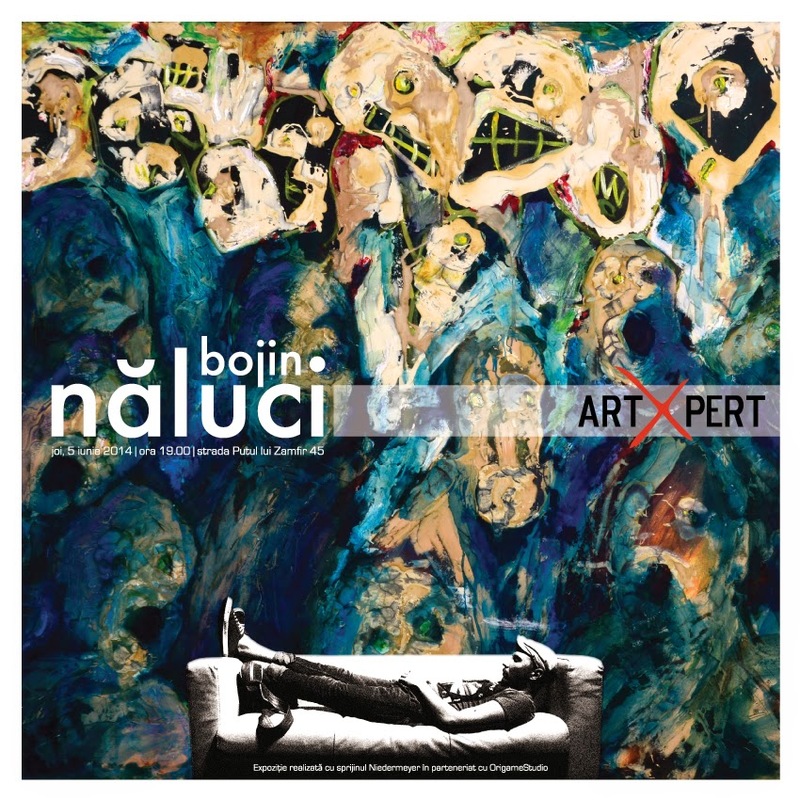 At the moment Balkan Expressionism gathers musicians (Taraf de Haidouks, Rona Hartner to name few), painters (Paul Hitter, Marina Obradovic), cinematographers (Kusturica) as well as anonymous traveling artists who uninhibitedly express themselves in a loud, colorful, joyful manner. However, the brutal reality is that, quarter century after the fall of the Iron Curtain, Europe as much as the rest of the world, remains ignorant to the art and artists from the Balkans. 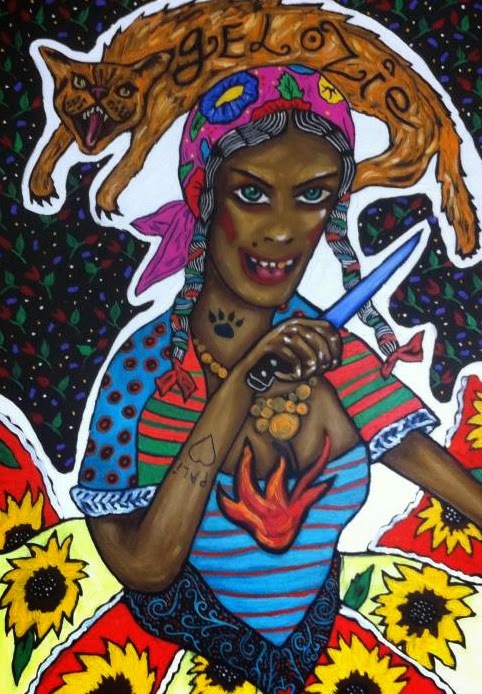 This is why many artists sharing this Balkan aesthetic are now challenging the world to accept artistic values that are ethnographically and sociologically different than typically accepted in the West. 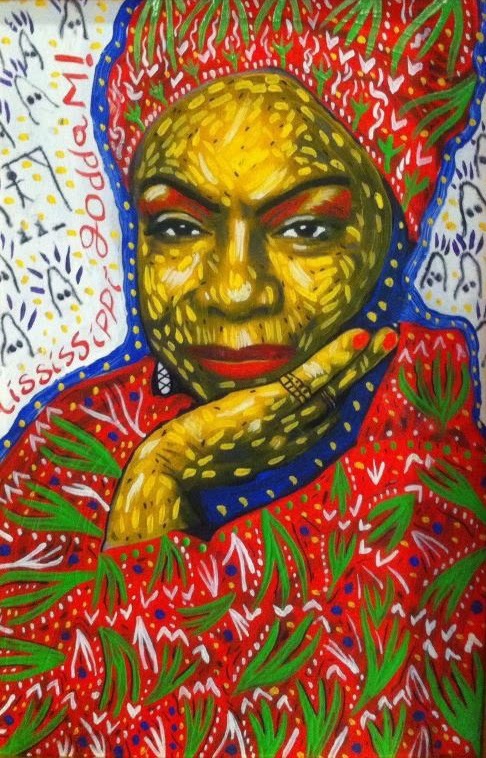 Many of us agree that art is not limited to business, money and corruption as it has lately been made. The general public has realized that true art does not fit the pattern established by corporate museums, compromised curators and meaningless brand name artists. In fact most people are searching for an alternative to this state of affairs, and no longer trust the „underground art” that has become a household name itself! We believe that the Balkan Expressionism Movement is a vehicle for a change to this paradigm and therefore a good reason for everyone in the art business to fear. In order to become a strong voice in the art world, the Balkan Expressionist artists must become united and willing to shake up a system that ignores them! Facts prove that there are tons of creative, artistic ideas, and many of the artists who possess these ideas would join this “ship of fools” here in the Balkans. In reality, there is so much substance in the Balkan folklore, in the urban stories, in popular design; enough to feed creative from all over the world. Despite the attitude of the West, we, the Balkan Expressionists, welcome outsiders in our pool of genes. 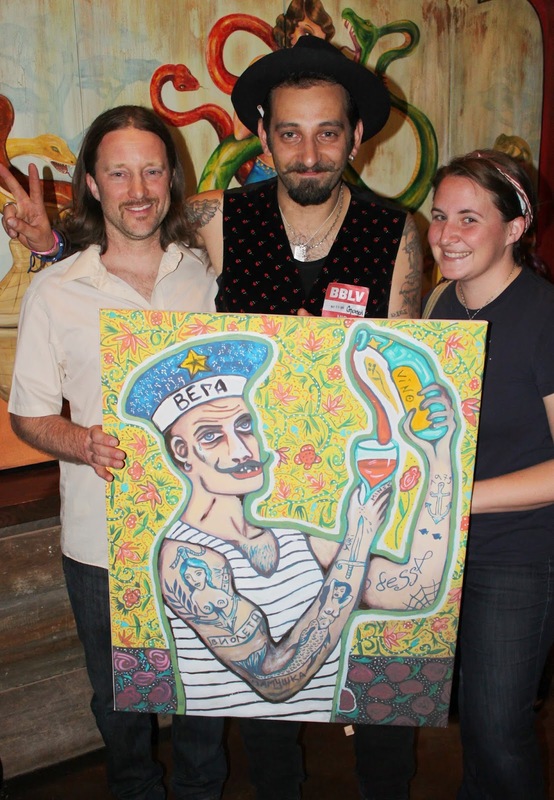 We know there are artists dreaming of being involved in an art movement that might shake up the world as we know it. We offer them an opportunity to take issues in their own hands and spit on false rules of the so called “art market”. Many of us have been cheated by the EU policy on arts that helps Eastern European artists in name only, but actually serves to block the development of regional art. EU funds for art are provided only through local governmental and non-governmental organizations, not to the artists themselves. This means that the local established art organizations control the requesting and distribution of art funds and routinely direct these funds to artists who meet their preferences and objectives. The funds are not provided to artists who possess the best aesthetics or to encourage new art movements or to under-represented segments of the local art community. Unfortunately, the art business is not immune to the ‘good old boys’ network, where those who have connections end up with the bulk of the art funding and artists who do not know someone in the local art, establishment, regardless of their abilities, end up with nothing. Without the support of the establishment, their work receives no exposure, no significant exhibits and therefore is likely to remain obscure and short lived. The time of „art hooliganism” has come! As long as we’ve been pushed to become the outlaws of European art, we are ready to take to the fight with nothing to lose. Every artist who joins The Balkan Expressionist Movement, results in the ”established art” and so called „post modern" art losing its breath. The good news is that a breath of fresh air is coming that smells like freedom – The Balkan Expressionism. Let’s not forget that our countries are the only ones capable of Revolutions and wars, so our artists can do the same! Many of us in The Balkans are restricted, as artists, from travelling due to visa requirements. We consider that freedom of expression should be based also on freedom of travel and performing anywhere in public places. Romanian and Bulgarian artists experienced the inconvenience of travel restrictions prior to becoming a member of the EU. Now artists from Macedonia, Bosnia, Serbia, and Albania suffer from this same problem. Either they want to study, create art, document or simply visit art establishments worldwide, but they simply cannot do it! The legal procedures and the bureacracy to obtain visas should not apply to artists! · If you're not brainwashed, don't wait for success to catch you, pursue your success and make it happen. Do not waste time waiting for State or EU funds to support your work, as the funds are dedicated to a pre-set artistic “elite”. The method and complicated mechanism of European funds distribution as well as the insufficiency of these art funds creates a situation where these funds are very difficult to obtain. It is well known that artists do not deal with bureaucracy very well. Applying for these funds requires more than common sense when it comes to paper work. On top of this, most of the state and EU funds are designed for NGO or Foundations, and are distributed only to artists who are “part of the system”, so those without the right connections will not have access to funds. · Freedom of public expression. Generally speaking, anything that is too loud or too much in your face should actually be accepted and nomadic artists should be allowed to perform in public places without city permits. Yes, people like you, that truly have to make a living out of their art should go out and perform, play, paint and exhibit their work in public places all over the world. As a matter of fact, no authority should treat a free artist badly! An artist should not be required to obtain permits to show their art, because they are a service to their communities, educating and stimulating the masses, without doing anything wrong. Even selling your art on the streets should not be an issue for taxation as far as we are concerned. No artist selling its original work on the street is creating fiscal distress to the society. · That surviving through art does not necessary mean selling your art in „proper” artistic venues as much as showing and selling it on the streets to the people that truly appreciates it and do not consider it merchandise. Take in consideration that today, fewer and fewer people enter galleries and museums around the world. Most of the population is busy working to bring bread to the table so fewer are in the mood to visit galleries. True artists should be proactive and show their art to the working class, the ones that truly appreciate it and do not see it as an investment or merchandise. If you, as an artist of any medium, feel the need to set you artistic spirit free and revolted against the artistic embargo set by governments and corporations, go out and show your art to the world. · Personal development and the rising of the awareness of the public should be the main purpose. Believing in yourself and struggling continuously for your beliefs is the number one condition on the path of success no matter what your background is. The truth is that an artist obsessed by success loses his creativity. For most of the people in the Balkans success has a different meaning than in the West. Success is more just a form of appreciation that does not necessarily require financial gain. Success sometimes means just the fact that an audience gathers around you and tries to understand your art. It is sometimes enough that people participate and share your joy and do not hesitate to show it to you. 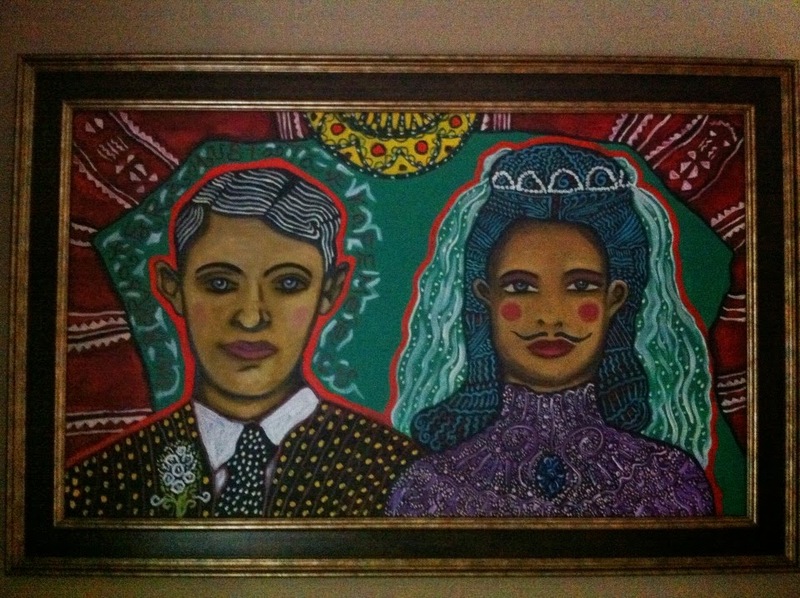 · Art should not be just a way of fun for the elites! If you feel that there are too many unwanted compromises on the path leading to success, if you feel that you stand alone in the jungle of the art world; then just get together, finding roots in the simple facts of life- the low life, the poor, the folklore, the urban legends should be the inspiration. · Individuality and spirit of brotherhood. Balkan Expressionist artists should help fellow artists from immigrants to refugees, from renegades to rebels. As all artist fight on the same ground an struggle with the same basic needs, why not thinking of the poor, most unfortunate. What about the artists that had to leave their families, their countries due to war or religious persecution? The Balkans offer many examples of refugee artists seeking shelter in other countries because of these issues. Who’s helping them? These are people with less than us, having no one to ask for help. Note: This Manifesto is the result of a thinking process of visual artist Paul Hitter, art curator and gallery owner Eugene Al Pann and art collector and art critique Steven Thompson. The genesis of Matei’s characters, their symbolism, as well as his interest in the circus can be found in his early association, beginning at the age of 13, with Traian Alexandru Filip, an internationally renowned etching artist and painter. As Traian’s apprentice, Matei studied the à la paupée technique of etching and in 1984 was asked to assist in printing a number of etchings for Traian’s upcoming exhibition in Italy. 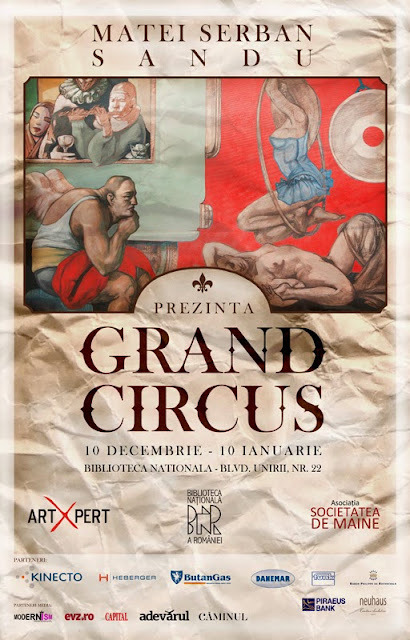 Among those works was one titled “Il circo” in which circus characters and animals represent the difficulties of Romanian life under the regime of Nicolae Ceausescu. The symbols in that etching were repeatedly used by Traian as his work became progressively darker and pessimistic in contrast to the regime’s officially sanctioned and purposely optimistic art of social realism. 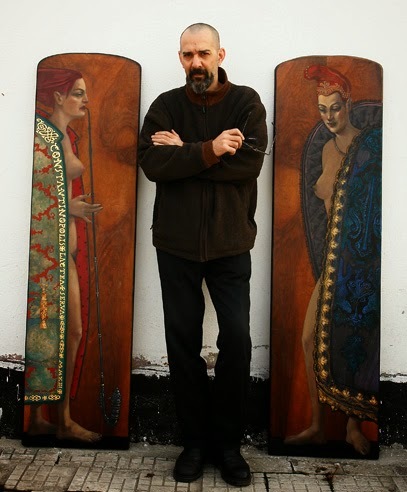 Traian began to let his art show his growing contempt for the regime and to raise international awareness of the plight of the Romanian people through symbolism using biblical, mystical and medieval compositions. Matei uses many of the same compositional themes in his paintings to speak of the societal issues facing all of us today and to deliver his own social messages. However, Matei uses humanity instead of animals or objects as his symbols. More specifically he uses the flawed, troubled, rejected or simply average parts of humanity, to communicate his social messages. His paintings examine our daily struggle walking the line between right and wrong, strength and weakness, and generally dealing the daily ‘circus’ of our society’s characters, especially those in positions of power. Or perhaps we are the circus performers in a society in which the ruling elite benefit from our work and the only chance we have of improving our status is to make it to center ring of the three ring circus. 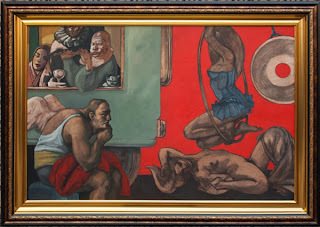 The “Circus is Coming to Town” series is the modern equivalent of the mythical with unique but outcast characters, such as the giant woman and the dwarf-strong man in “The Arena” as well as the hunchback and the contortionist in “The Caravan”. The characters in the paintings, some repeated from his previous works, have a common element. They are solitary, generally not interacting with others, and in the few instances where characters do show a connection, it is impersonal. In fact no character looks at another and only two in the entire exhibit actually look at the viewer. 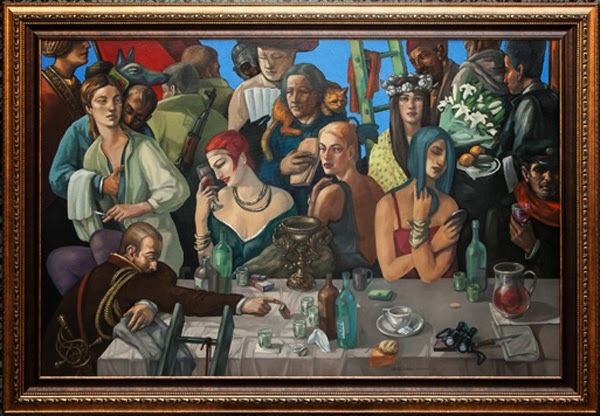 Each person crowded around the table in the “The Graal” is unaware or indifferent to the others surrounding them, a reflection of our society today. Matei’s artistry in composition, skilled use of symbolism, and supreme craft of execution create works that are immediately attractive while also possessing a much deeper meaning. His work draws you in, forcing you to study it and contemplate the composition and message. The characters, individually and together, are the symbols, communicating Matei’s social critiques. It is the viewer who must ‘read’ the paintings and the messengers therein. 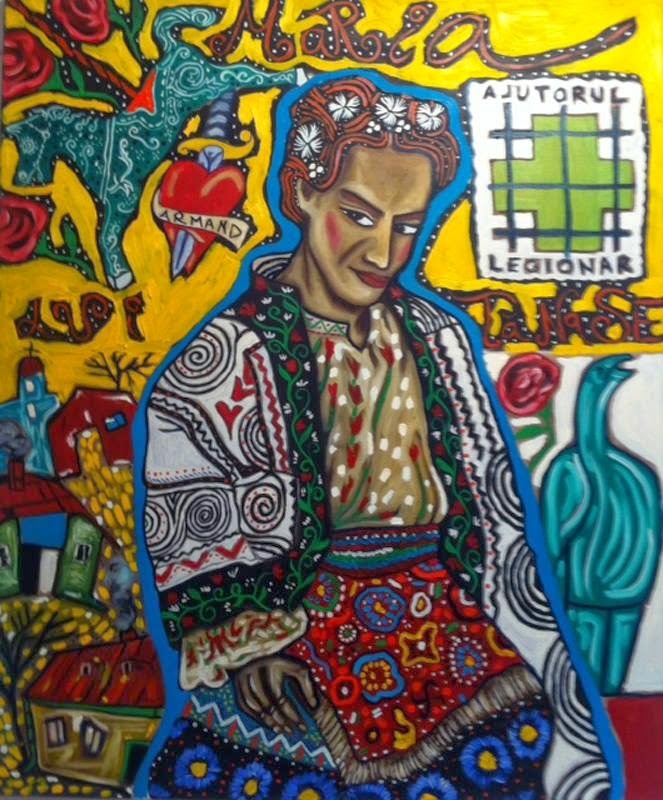 This exhibit in the Romanian National Library brings the story of Matei’s art full circle. Designed and started in 1986 as a principle part of Ceausescu’s ‘celebration of socialism’ development project, the National Library building today hosts the work of one of Romania’s most significant artists who has carried on the social criticism begun by the most important artistic voice of the communist era which the dictatorship failed to silence. New York City — A triptych by British painter Francis Bacon -- "Three Studies of Lucian Freud" -- sold for $142.4 million, smashing the world record for the most expensive piece of art auctioned. The work by the 20th century figurative artist, who lived from 1909 to 1992, had never before been put under the hammer until Christie's flagship evening sale, on Tuesday. It was bought by a New York gallery. 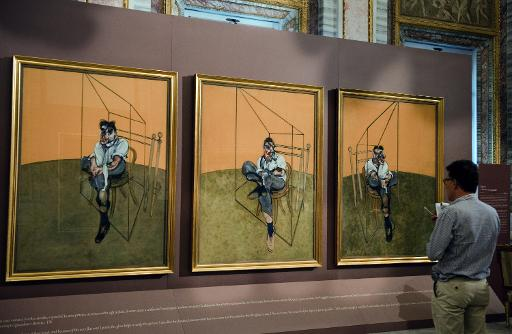 "What's amazing for us to see is obviously the highest price ever paid at auction for a work of art, the Francis Bacon," said Brett Gorvy, head of post-war and contemporary art at Christie's. The most expensive artwork ever was a Cezanne that sold for $259 million in 2011. But that was a private sale, not an auction. Gorvy named Acquavella Galleries, which is based in New York, as the buyer at a spectacular auction that broke a string of records and totalled sales of $691.6 million, the highest in auction history. Hammered to an outburst of applause, the Bacon surpassed the previous record of $119.9 million fetched by Edvard Munch's iconic "The Scream" by rival house Sotheby's in New York in May 2012. Bidding lasted six minutes and was split by would-be buyers on three continents, opening at $80 million and escalating in seconds. "An historic moment," said auctioneer Jussi Pylkkanen at $126 million as he drove the price yet higher. The triptych, the only one not in a museum to date and executed almost 25 years after Bacon and Freud met, is the most expensive single lot offered in the New York November auction season. Officials said it was particularly special because Freud, a close friend of Bacon, went on to become a hugely important artist himself in later years. The previous record for a Bacon painting was $86 million in 2008. Christie's sold a total of 63 lots of post-war and contemporary art for $691.6 million, the highest total in auction history. In total Christie's broke a further 10 world records. It sold the giant orange "Balloon Dog" sculpture by Jeff Koons for $58.4 million, making history for the sale of a work by a living artist and history for a piece of contemporary sculpture. It is one of five different colored such pieces by the American, who has most recently collaborated with Lady Gaga providing artwork for the pop diva's third album, "Artpop", which was released on Monday. "We're also incredibly proud to see the highest price achieved for a living artist, Jeff Koons, well deserved for the 'Balloon Dog'," Gorvy told a news conference. The statue, on display outside the auction house in Rockefeller Plaza, was eagerly snapped by tourists and art lovers outside. Several police officers mounted on horses sat guard late Tuesday. The previous record for a Koons piece was $33.7 million. Other artists who achieved world records were Christopher Wool whose "Apocalypse Now" sold for $26.5 million, Wade Guyton, Vija Celmins, Lucio Fontana, Ad Reinhardt, Donald Judd, Willem De Kooning and Wayne Thiebaud. With Impressionist and Modern art harder to come by and many of the great works in museums, art officials say contemporary work has driven an explosion in prices in a flourishing market. "Tonight we showed ultimately the strength of this market and the diversity of this market," said Gorvy, insisting that the value of post-war and contemporary art would only increase "incredibly". "I really believe we are at the beginning of something. This is not a bubble. This is not something which ultimately doesn't have great foundation stones," he added. He said collectors had bought "very sensibly" and "very aggressively with a lot of competition". Buyers from 42 countries registered to bid on Tuesday and despite tremendous interest from emerging markets in Asia, the Gulf, Russia and Latin America, Americans dominated. "A terrific, exciting night," Doug Woodham, president of Christie's Americas, told a news conference. "The new world record for auctions anywhere in the world which is a phenomenal evening of amazing masterpieces," he added. Copyright Business Network International. Simple theme. Powered by Blogger.